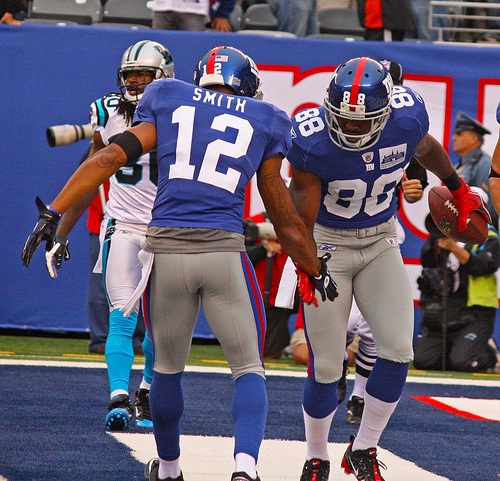 Home › Injury Updates › Hakeem Nicks: Is 12 Weeks A Realistic Timetable For Recovery? Hakeem Nicks: Is 12 Weeks A Realistic Timetable For Recovery? Hakeem Nicks broke the fifth metatarsal in his right foot yesterday. Early estimates put his expected recovery at 12 weeks, giving him a chance to return to the field by mid-August. Giants’ head coach Tom Coughlin wasn’t as confident, saying “it’s probably going to be close” when asked if Nicks will be ready for the season opener on September 5. How realistic is the 12 week timetable? Though optimistic, it is realistic according to a study done by Dr. Robert Anderson of the Carolina Foot and Ankle Institute. Anderson, who will be performing Nicks’ surgery, is the go-to surgeon for NFL players with complicated injuries, especially Lisfranc injuries, Achilles tendon ruptures and fifth metatarsal fractures. Anderson’s 2011 study looked at outcomes for elite athletes who required surgical revision of a poorly healed or re-fractured fifth metatarsal. While Nicks’ injury does not fall into that more concerning group, he’ll very likely be undergoing the same surgical procedure – screw fixation with bone grafting – and have a comparable rehabilitation schedule. Of the 21 athletes Anderson studied, 12 were football players. Nine of those twelve returned in 12 weeks or less, three returned within 15-16 weeks. Among all 21 athletes, 16 returned to their sport within 12 weeks. All returned to their previous level of competition. Though Anderson’s study is reassuring, Nicks’ rehab and recovery won’t be without potential setbacks. Areas of the fifth metatarsal are notorious for inconsistent healing and re-fracture because of relative poor blood supply to parts of the bone. Anderson’s method seems to limit those complications with the aid of bone grafting, but a player pushing the limits of the recovery timetable will heighten the risk of re-fracture. Should Nicks successfully rehab after surgery, he’ll also have to avoid a cascade injury – an injury to another, previously unaffected part of the body – as he gets into football shape late in camp. Hamstring or other muscle strains are an all-too-common occurrence as players attempt to return to their previous level of play before fully conditioned. The bottom line: While Nicks may be able return to practice during training camp, those final 2-3 weeks of rehabilitation will be critical. If he makes it through the end of training camp without a compensatory injury, he should be considered fully healed and back to his baseline injury risk. Unfortunately for the Giants and Nicks, who has yet to finish a full 16 game season, the durability concerns won’t be going away anytime soon. This is the kind of detailed analysis that brings me fantasy football championships year after year! So with respect to Fantasy do you stay clear of him completely or if he’s therein the middle rounds you grab him? @Chuck I think it’s reasonable to drop him out of the elite tier if you’re drafting in the next 6-8 weeks. After that, if he’s running without setbacks, I’d adjust however you would for a player with a history of injury and possibility of cascade injury. I’d be willing to take a chance on him at the back end of the elite tier, assuming some risk to target his upside later in the season.. Excellent commentary. The analysis of dropping him out of elite tier for now and moving him up based on running with no setbacks is spot on. I think Adam Schefter just posted a shorter time frame for recovery today. Just backing up the info presented here. Great work Jene. Love this blog, really fills a missing niche in fantasy football. Fantasy Football stuff aside, this is fascinating stuff. I appreciate the articles dude.